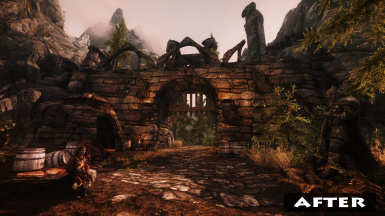 Adds new, unique and immersive gates to the border crossings of Cyrodill, Hammerfell and Morrowind. 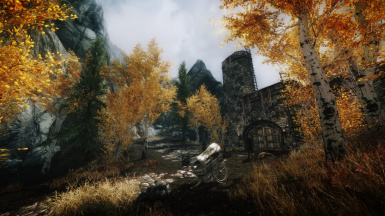 Paid Mods are prohibited from using any content from this mod. 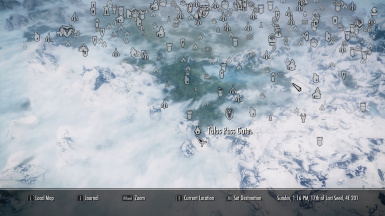 Do not use any content from this mod in another mod without my permission. Do not upload this mod to another website without my permission. Added the missing mesh to UniqueBorderGates-All, UniqueBorderGates-SilgradPass and UniqueBorderGates-SilgradPass-BetterDGEntrance. 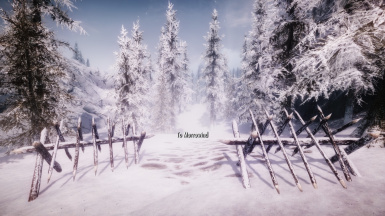 Corrected missing wall in UniqueBorderGates-All-MoreImmersiveDawnguardEntrance. 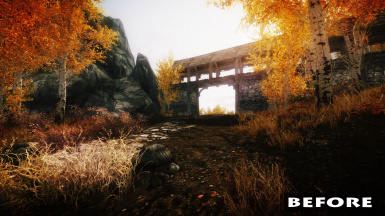 Updated UniqueBorderGates-All-ShadowOfMorrowind and UniqueBorderGates-DunmethPass-ShadowOfMorrowind for 06c version of Shadow of Morrowind. 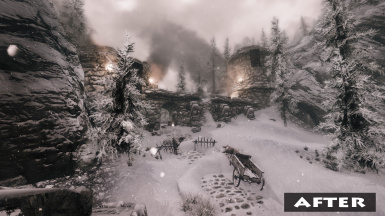 Added UniqueBorderGates-SilgradPass-ShadowOfMorrowind for 06c version of Shadow of Morrowind. Fixed floating torches in UniqueBorderGates-DunmethPass and updated UniqueBorderGates-All accordingly. Added an all-in-one version with compatibility patches under Main Section of Files. Moved all standalone versions under the Optional Section of Files. Now all NPCs should have a unique appearance. Dunmeth Pass Gate: More clutter added to better represent its destruction. 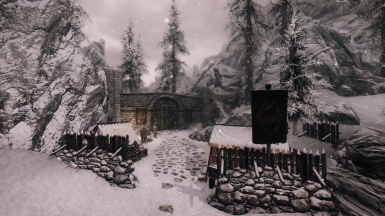 Pale Pass Gate: Added a new standalone version for The Cyrodiil Frontier. It contains only the gate. 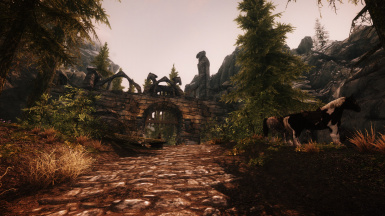 Talos Pass Gate: Repositioned the horses with new hitches. Adventurers have an equal chance to be male or female and of any vanilla race. Redesigned and expanded all the gates. 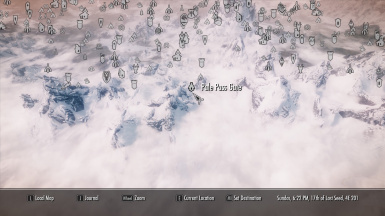 Renamed Cyrodiil Border Gate to Pale Pass Gate and Hammerfell Border Gate to Talos Pass Gate. 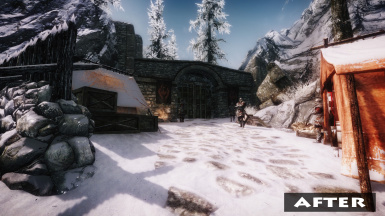 Added the ability to walk through the gates of Dunmeth Pass, Pale Pass and Talos Pass and teleport to the other side of Silgrad Pass. Added new and more unique NPCs with variety for the generic Imperial soldiers and named Adventurers. 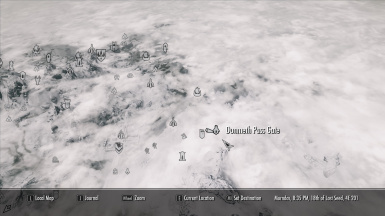 Added compatible versions for More Immersive Dawnguard Entrance, Point the Way and Shadow of Morrowind. 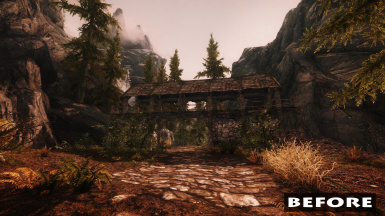 Unique Border Gates redesigns the border crossings of Cyrodill, Hammerfell and Morrowind by adding new, unique and immersive gates. No two are alike and I believe the design reflects the area well. Each location is discoverable and you can fast travel after discovery. The following are brief and spoiler-free descriptions of each gate. 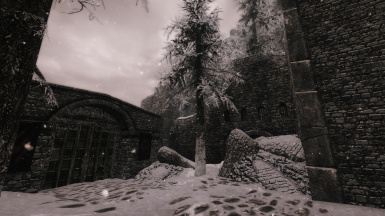 Located in northeastern Eastmarch Hold along the northern road leading into Morrowind, this gate is of Imperial design. It has recently experienced a destructive battle during the Civil War. 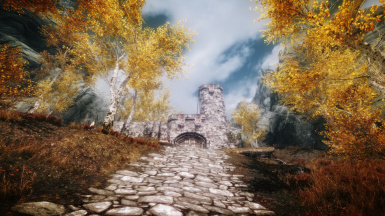 Located in southeastern Falkreath Hold along the road leading into Cyrodiil, this gate is all that remains of an old ruined fortress of Whiterun design. 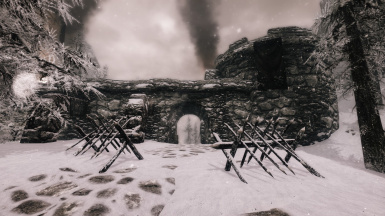 Imperial soldiers have fortified the gate to protect the Pale Pass. 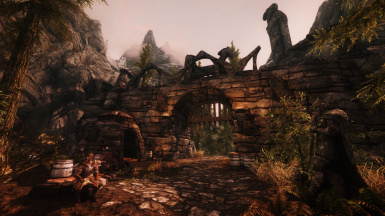 Located in eastern Riften Hold along the southern road leading into Morrowind, this gate is of Riften design. Last anyone knew Riften soldiers were guarding it against bandits and smugglers. 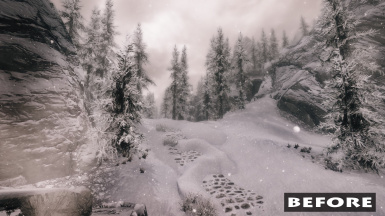 Located in southwestern Falkreath Hold along the road leading into Hammerfell, this gate is of ancient Nord design. It features massive stone structures and an impenetrable iron gate. It is so named in dedication to Talos, who is said to have spent time in the region, with a statue frequented by adventurers heading west. Incomplete WIP. 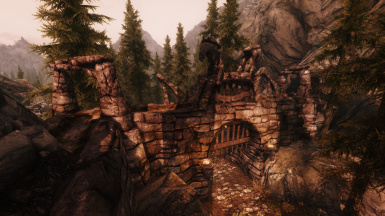 Located in western Haafingar Hold along the road leading into High Rock, this gate is of Dwemer design. 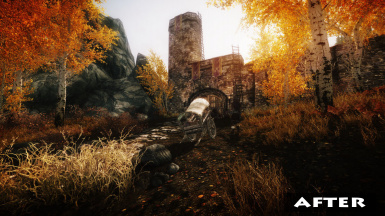 Once an ancient tunnel through the Druadach Mountains, Thalmor agents destroyed it to hinder the rebellion. I will not be able to complete this mod due to full-time employment and a new baby. Sorry. Skyrim is the only requirement. Works with or without DLCs. The Optional Section under Files contains the various standalone versions. You should NOT use these if you're using the All version, and only use one version per gate. Load order shouldn't matter, but the ones requiring another mod need to be loaded after that mod.When updating or switching to a different version, I recommend saving your game someplace far away from any of the gates before updating. This should help avoid any unsightly errors when you install the new version. 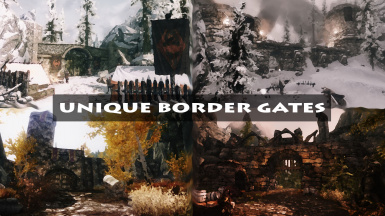 Any mod that edits the same areas as Unique Border Gates may not be compatible. Notify me of any conflicts so I may create a compatible version if possible. More Immersive Dawnguard Entrance - Adjusted landscape, fixed floating plants, re-enabled trees and added a road piece. 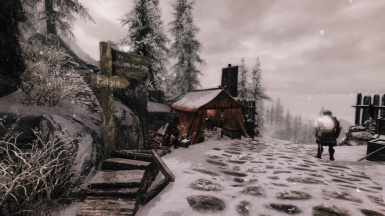 Point The Way - Moved the signpost to avoid clipping and replaced the signpost with snow-covered variants for immersion. 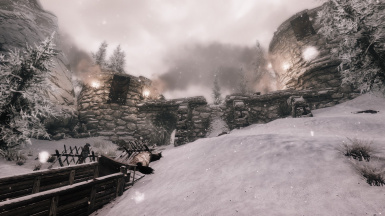 The Cyrodiil Frontier - Fight Against the Thalmor II - Removed the Imperial camp from my mod so it only has my unique gate and ruins. Shadow of Morrowind - Moved the auto-load door so it won't be activated until after passing thru my gate. Closed and Guarded Border Gates - Conflicts with ALL. 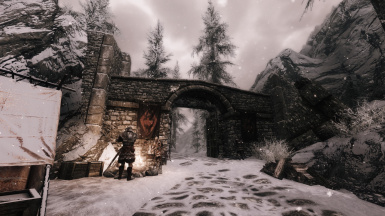 Hammerfell Border House - Conflicts with Talos Pass Gate. Morrowind Border Guards - Conflicts with Silgrad Pass Gate. 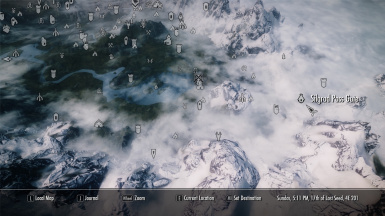 Open Border Riften to Morrowind - Conflicts with Silgrad Pass Gate. Vanilla navmesh has been untouched. 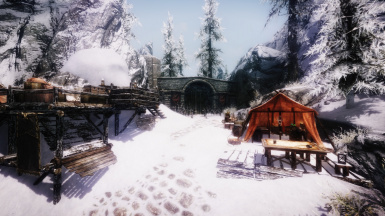 Vanilla gates and other objects have been disabled, not deleted. 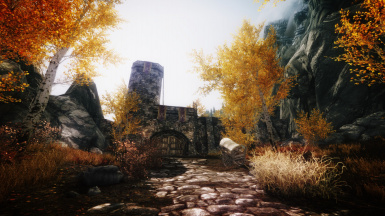 Mod has been cleaned with TES5Edit.